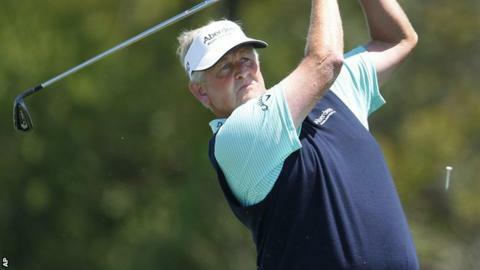 Ryder Cup hero and eight-time European Tour order of merit winner Colin Montgomerie won the US Senior PGA Championship in Michigan on Sunday. Montgomerie, 50, finished 13 under par to beat eight-time major winner Tom Watson by four shots and twice Masters champion Bernhard Langer by six. The Scot, who was runner-up five times in majors on the regular tour, also secured his first win on US soil. "It's been a long time. It's a very special moment," he said. "We've come close on a number of occasions and it's great to finally break that duck." Montgomerie, who captained Europe to Ryder Cup victory in 2010, won 31 times on the European Tour. He became eligible for the Seniors Tour when he turned 50 in June 2013.